Not only it is simple to prepare, but has an impressive appearance, and very light texture. This cake makes a perfect light dessert, as well as a great bake sale item. If you don’t care much for craisins, you may substitute them with raisins. Actually, other fruits may be used, such as peaches, pears, or plums. Line a 13-18 baking sheet with greased parchment paper. Place apples on baking sheet (domino style), overlapping slices, until the whole pan bottom is covered. Sprinkle evenly with craisins, then sprinkle the top with lemon juice and mixture of brown sugar and cinnamon. In a medium bowl, beat egg whites until stiff peaks form. Halfway through, add 1/4 cup of sugar to egg whites and beat some more until sugar dissolves. Set aside. In another bowl, beat the egg yolks with the remaining 1/4 cup of sugar, until lemon color and thick in texture. Mix flour with salt and baking powder. Gently keep on adding and mixing the flour into the yolk mixture. Mix in vanilla extract. Pour the batter over apples, and even out with the back of a spoon. Preheat the oven to 350 degrees F, and bake 23 minutes. Remove from oven, cool off for 5 minutes, then invert onto a waxed paper, so apples are on top. While the cake is still warm, gently remove the parchment paper and discard. 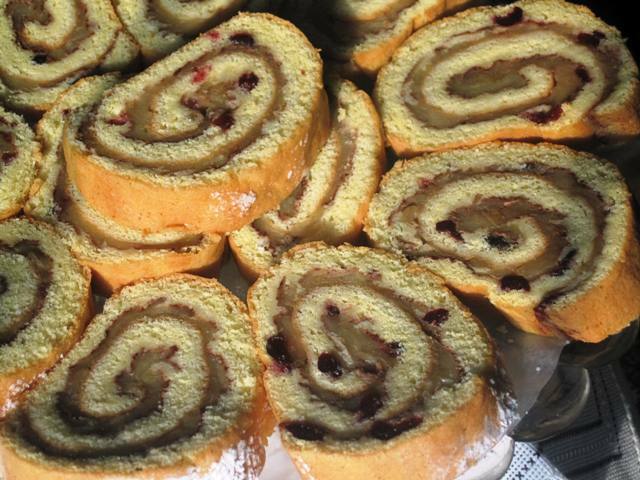 Begin rolling up firmly from the longer side toward the other side, until a jelly roll is formed with the cake on the outside and apple filling on the inside. Wrap the roll with waxed paper to store in the fridge until ready to use. Before cutting it up into discs, generously sprinkle the top of the roll with powdered sugar. Thanks for sharing this recipe, as I read the instructions, I was thinking of my Mom who made Jelly Rolls regularly of how use would invert the cake on to a clean tea towel dusted with icing sugar. Parchment was not used.. I still use the tea towels when making Pyrohy! I love making this cake, since it is easy and presents itself so well at serving time. I also use a cotton tablecloth to keep my verenyky on between pinching and boiling.